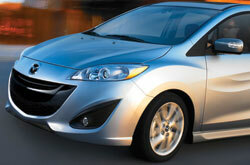 The Mazda5 is a compact minivan designed for buyers who don't require the capabilities or space of a full-size van. Introduced in 1999, the 5 has become a popular model in its segment and has won awards for its functionality and safety features. For 2014, the minivan reenters the market with its expressive styling and undeniable charm which have been carried over since its redesign in 2012. It also continues to be affordably priced, features a practical interior and handles with the ease of a car - a rare quality in today's minivans. To discover additional information about the 2014 Mazda5 in Houston, read our brief summary below; then scroll down for extra spec information and exclusive photos. Although the 2014 Mazda5 in Houston is much smaller than other minivans available today, it's still incredibly functional. Inside, the minivan features seating for six and an elegant dashboard with a host of user-friendly controls. Front- and second-row seating is also comfortable for all in-car occupants. The second-row configuration is especially cozy thanks to its reclining captain's chairs; the passenger-side seat features a foldout table that can be used during long road trips. The third row is also easily accessible, providing plenty of room for children to enter and exit the vehicle without a problem. In addition to these benefits, the Mazda5 offers a maximum of 97.7 cubic feet of space within the cabin - an above-average number praised in Edmund's 2014 Mazda5 review. Powered by a 2.5L four-cylinder engine, exerting 157 horsepower and 163 lb.-ft. of torque, and coupled with a well-tuned suspension, the Mazda5 features sharp handling and is easy to maneuver in both urban and rural areas. A tight turning circle can be attributed to the minivan's outstanding performance, while its smooth ride quality is a benefit of its suspension - noted in several 2014 Mazda5 reviews. Despite its large size, it also drives much-like a car and is a great choice for small families. Compare Mazda's newest model of the Mazda5 to its rivals and we're certain that you'll choose it over vehicles like the 2014 Acura TSX, Hyundai Sonata and the Nissan Altima. 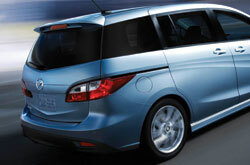 Shoppers will be pleased with the Mazda5's handsome styling, as well as its progressive cabin features. Many drivers in Houston choose it because it's a fabulous value; compare its price to the opposition to see for yourself. Find out more details about what it offers in our bullet list below! Welcome to the Joe Myers Mazda review of the new Mazda5. After reading our overview above, if you decide the Mazda5 isn't the best vehicle for your traveling needs, please check out other 2014 Mazda reviews in our research gallery. 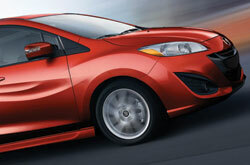 There is a reason why we are one of the Houston area's premier Mazda retailers. Just one reason is that we provide reviews written by well-informed automotive writers. 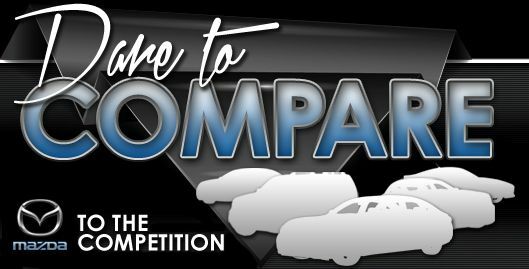 Everything perspective car buyers need to make sensible decisions is right here, including info regarding mpg and other specs. Each paragraph is overloaded with practical information and specs - all at your fingertips. Is the Mazda5 not the right model for you? Learn more about other vehicles offered by Joe Myers Mazda using our reviews index. With it you can review and compare Mazda's entire lineup of vehicles.